Aero Collision was proud to support teacher appreciation week for Como Park Elementary. 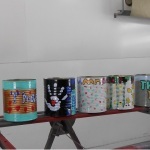 We clear coated these cans for the Como Park Elementary School PTO. The cans filled with a gift were given to the bus drivers during teacher appreciation week.